Musician and writer Matt Fanale is the founder of the industrial band Caustic and creator of the Failing Better blog, dedicated to offering advice to musicians about how to survive as a musician in the modern music industry. He got his start in the music industry working as a Goth/industrial promoter and DJ while majoring in film at the University of Wisconsin, Madison. After finding success within the industrial scene and creating the Reverence Music Festival, he decided to launch his own project, Caustic in 2002. Using the contacts he made booking bands across the country as members of his “rotating band of freaks,” he started regularly playing shows and releasing music and was eventually picked up by Metropolis Records. 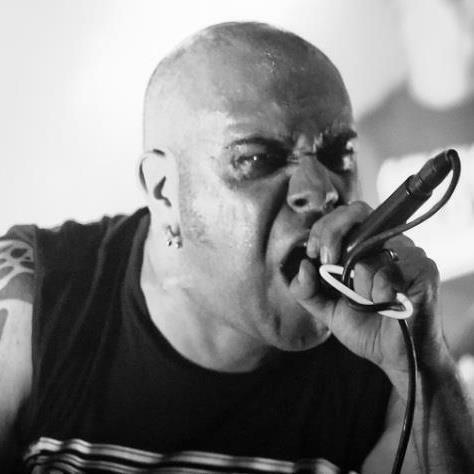 Matt has performed worldwide with popular industrial bands like Atari Teenage Riot, Combichrist, KMFDM, Grendel, God Module, Faderhead and many more. He started the Failing better blog as a way to share his on-going experiences in the music industry with other artists to help them learn to better navigate it and find success doing what they love. Matt talked to me about his experiences creating a name for himself and building a global fan base in the niche industrial music scene. He also talked about the importance of tenacity in the current music business and shared some advice about how artists can create a flexible marketing plan. Thanks for taking the time to talk, Matt. How did you get started with music? I didn’t start out playing music. I started out as a DJ and then moved up to promoting shows here in Madison, WI. It’s a college town, so it’s a relatively small scene for everything. But I was fortunate that I jumped into the Goth/industrial scene here at a time when everyone else had burned out. By the time I was booking shows, everyone else here that had been promoting shows either for the University of Wisconsin, Madison or privately had become really jaded and cynical. I had a lot of enthusiasm, because I thought it was really awesome that a) I was able to even do it and b) I was able to do it well enough that I was breaking even/not losing anything on a show. The bands and the crowds were both having a great time. And when you’re doing smaller shows, breaking even means you were a success. Then I moved up to promoting my own festival, which I did for about seven years. It was a pretty small event with a couple hundred people called The Reverence Festival, and we’d have our friends come out and have a great time. I built up a pretty nice reputation for that as well. When I finally got around to making music, I had a ton of contacts through booking and knowing people who played music. It’s interesting that you didn’t start out as a musician. Yeah. I didn’t start out as a musician at all. I was a visual artist and ended up at University of Wisconsin as a film major. And then I started writing a lot, but I never officially did it until I started blogging, which is obviously a lot different from other types of writing. But I’ve explored a lot of different creative avenues. I was a DJ and also was booking shows, then got into a lot of different software. And we had a really vibrant music scene here at the time with some artists who were also doing really well outside the local area. It was inspiring to see that you could be from this place and accomplish a lot of you had tenacity. That’s something I’ve always tried to blog about and talk about: You really have to stick with it and never give up if you want to succeed. No matter what your definition of success is in the music industry, the key to it is to never give up and always keep pushing to find different ways to make music. When I started playing music, it was really raw and basic. I was performing little noise fests. Music was in quotes a lot. I started building up and was really able to start getting my footing, because I figured out how to talk to people; I used my sense of humor and also could write clearly. And I actually also have 20 years as an improv performer. I knew I was funny, knew how to promote myself in a humble way and how to keep switching up how I talked about myself, so it kept people interested and from feeling like they were being bombarded with the same BS all the time. There’s that “show” in show business that people forget about a lot today. Exactly. I always knew I had to keep people engaged. I was able to get people on board to support me by being someone they wanted to support. I made things fun for people. And I really found my niche because I was able to get people to relate to things I was saying in my blog – even if I was saying something harsh sometimes. I have said things like, “You are not a f*&king revolution.” But I have always pointed back to myself: “And I’m not either.” I’ve never want to put someone on the defensive. I just want to point out the truth and tell people to get over themselves, get off their asses and work. And it sounds like Caustic is working as a project. It’s doing well. I started the project in 2002 and started putting music out in 2004-2005. I’ve been writing about an album per year since then, partially because I really enjoy making music and partially because I figured out a budget that allows me to put out music and never lose money. I eventually got signed to Metropolis Records, which is the biggest label for this type of music. They operate out of Philadelphia and have a lot of major industrial acts. They just signed Skinny Puppy and put out their latest album. It’s kind of cool to be on a label with bands that got me into what I’m doing now. I’ve also had some contact with Martin Atkins and looked at some of his Tour Smart book. He comes up to Madison a lot to teach, and I did a podcast for a while that he sat in on. The stuff he’s doing is at a level above where I am. He’s talking about getting on tour buses, and I’m talking about going in vans. I think what we’re talking about is complementary. At the heart of it, we’re both saying you have to get up and work. I think the big moment for me was when I found my voice. And that’s what I tell other people: Be tenacious, find your voice and stick with it. And don’t compromise. And you might get to a point where people are going to ask more of you and try to get you to compromise your sound. In this day and age, musically, there’s not really a reason to do that anymore. A lot of music today is being made for niche audiences, unless you’re talking about really mainstream music. Well, and it’s not like Monsanto is seeking an industrial jingle. Right. No one is really looking for that. And no one has cared about the genre in a long time. People will start often throw around the term “industrial,” but it’s usually in a different context: “The Smashing Pumpkins are using industrial elements;” “Marilyn Manson is incorporating an industrial sound.” It’s almost like they’re hearkening back to a lost era. Our genre hasn’t moved forward musically in at least 15-20 years. Because the industrial genre has been stuck in a rut, I see no reason why people should be copycatting. But it happens in ever genre: punk; metal; etc. It’s easier for a person to be like someone else, because that person knows that’s what works, and therefore making something that is the same is easier than making something that is interesting or different. You managed to find a niche that you were interested in and become successful within that niche. How did you put together shows and build beyond your hometown? My improv background served me well, because I was able to make it work by basically taking gigs all over the place, getting paid as much as I could for them and flying to them by myself. Because I had lots of music contacts, I had musicians to play with in many different cities. I had a Caustic West Coast band, a Caustic East Coast band and a band in places like Texas. So, some of the meat of the song was in backing tracks, and then I’d have musicians fill in the gaps and play what they wanted. Basically, the backing tracks would be the control, and the live musicians would be the variables. Part of what drew me to improv is that I actually love that kind of chaos. And I work best when I know it’s going to happen. At this point you are playing in venues across the U.S. and around the world. How did you actually line up and book the gigs for Caustic to begin with so you could expand to new markets? It happened largely because of the Internet. It was about knowing bands in other cities because I had booked them, but also about networking. The power of networking cannot be underestimated. That’s pretty much how you found me, too. Somebody you knew said something about what I was doing, and you got in touch. When I was first starting with Caustic, I was on Myspace, which was big at the time. And I was in contact with all these bands I’d booked from other states and from each coast, so I would get in touch with them and say something like, “Hey, I’m heading to New Jersey to visit my family and would love to play a gig in the New York City area while I’m there.” And I’d have friends say I could play at someone’s basement party or in a club for a specialty night. I would do it for very little money, because, first of all, I was going to be in the area already and secondly, I took whatever I could, because I just wanted the exposure. I was flying to different places. But I was also playing places I could drive to, like Chicago. And people would hear about my shows, because, for this genre, a lot of the bands were trying to be really polished, and I was putting on shows that were a little more punk than industrial. So, it was a little bit of a different experience. Some people actually think of me as more of a punk-electronic artist than EDM or industrial. I was able to build a reputation by having crazy shows. I created a party atmosphere, which a lot of other industrial bands weren’t doing. And it just became fun to have Caustic come play, because even if you didn’t know the project or like my music, you would enjoy the show. It was always fun to watch. A lot of building my reach as an artist was about honing my live show based off of techniques I had used in improv over the years. I was never uncomfortable onstage or looking stupid. I went into every show just excited to see what might happen, and more often than not, it would turn out great. If it wasn’t great, it was at least memorable. Every show had a moment that surprised me. In a lot of ways, I set Caustic up to fail. I went into it saying, “Something is going to malfunction, get unplugged, go out. Something will happen onstage that will ruin everything.” One of the key concepts of improv is the idea of “Yes, and”: No matter what happens, you move forward. I took that idea of “yes, and” and used it to spin everything that went wrong into something positive for the band. I would keep moving forward, whether something would go wrong with booking the shows or releasing music. And with my first CD, I had a censorship issue that cropped up, and we couldn’t find a pressing plant for it. So, we spun it into talking about the experience of censorship, which got us a lot of press and gave the album more exposure when it finally came out two months late. The “yes, and” flexibility really is the key to everything. When people ask me for a definitive, set-in-stone long-range marketing plan, I can’t really offer that. I can hand them a roadmap, but I really have no idea which roads will be flooded, out or riddled with potholes. My goal is to spin every negative into a positive. For example, if a tour falls through, how can you use the contacts you got through that experience to spin it into something else? I got kicked off a tour after 24 hours, and it became this huge controversy. And in the end, I got more exposure and more support as a result of getting kicked off that tour than what I would’ve gained through participating in the whole thing. That “yes, and” is really about knowing how to be smart and not freak out. The “yes, and” is also about not being unprofessional. I see a lot of people whining online about the things that happen to them. They don’t understand that this is a business. Even if you’re working in a very small sector of the music business like I am, you have to make sure that you don’t burn bridges. If you’re going to burn a bridge, you better be sure it won’t come back to bite you later. I think I’ve always been of the mindset that I can make anything bad good. I see other bands in the scene that don’t have a sense of humor or the attitude I have. And I feel bad for them, because I think not being able to step outside that box is really limiting what they are able to do. When I first set up Caustic, I set it up in a way where I would always step outside the box, expect to fail and never have to apologize for messing up. That’s wise. It sounds like you have the creative side of things down. What did you do from a marketing and business perspective to get traction? My attitude about the project was always that I didn’t care what people thought; I just wanted to have a good time. I think self-seriousness is a big problem with a lot of bands in this genre. There are clichés in every genre, and when they start to overflow, everyone starts to copy them, because that’s what has worked for bands before them. But they don’t realize that being different and having a different angle is the way you’re going to stand out to people that will be fans of your music. You can have things in common with other artists, but it’s the angle you take and your ability to insert your own individuality into it that will make you shine. I took that very personal angle with marketing and was very open about myself as a person. For instance, I have a drinking problem (I have quit drinking), and one of the biggest things I did was admit it publicly. It blew people away, and they couldn’t believe I did it. First of all, I wanted to be honest and wanted it out there so people wouldn’t keep offering me drinks all the time. But I think what artists don’t realize is that putting yourself out there as a human being can get you more support than anything else you do. I think this is something many of my favorite comedians do, like Louis C.K. and Doug Stanhope, who was on one of my early CDs. Marketing for me has always been about finding that twist that makes me different. An interesting exercise I did was to look at some of the artists I am not into and how they are writing about and presenting themselves and get critical about why I wasn’t into them. And it helped me a lot to see what I was doing wrong and how I wanted to talk to people. What would you say are the key marketing drivers for Caustic? For me, they have all been related to social media. Facebook and Twitter have become huge for me. I invested a little bit into targeted Facebook ads. And blog entries have big as well. I post them, then a lot of people share them, which leads to people checking out my band. I have people that come for the blog entries, then discover my music and really like it. Of course, my personality is very tied to the music, but it is also tied to each of the blogs I keep, which helps me a lot. I have a two-month-old baby at home, so I’m not going to get to do a lot of shows in the near future. If it weren’t for social media, I wouldn’t be able to keep things going with Caustic. In the past, I’ve played a lot of shows and gone on some tours, but I’m not one of those people able to be on the road a lot because I work multiple jobs. To further answer your earlier question about how I expanded to other markets: Thanks to social media, I was able to pick and choose where I would fly and get opportunities overseas for festivals where I could hit a lot of people at once that would help broaden my fan base. And a lot of the people at those shows had read the things I’d written. It’s the synergy of being able to write about things, perform and write music that people can get into that has helped me build a career as an artist. Of course, what works for me is not going to work for everybody. I think all artists can have success in the music industry; they just have to know what they’re getting into, know it’s not going to happen overnight – because a music career is all incremental – and know that to be in this business, they’re going to always have to work their asses off and really enjoy making music. To learn more about Matt Fanale, visit the Failing Better blog and follow Caustic on Twitter.